Jamie Moyer won't be in the booth for the Phillies broadcast games in 2015. That might be a good thing, as the broadcasts last year with the two new additions to the TV broadcast team were seriously lacking for about the first 3/4 of the season. 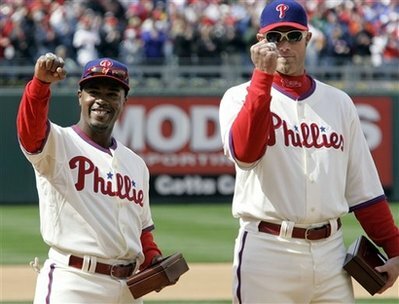 Jamie Moyer and Matt Stairs shared the duties after the longtime broadcasters Chris Wheeler and former Phillies player, Gary Matthews contracts were not renewed for the 2014 season in a surprise move. It's important to note that this was Comcast's decision and not the Phillies. Comcast Sportsnet will be searching for a replacement and wished Moyer well for his services, as Jamie cited family time as his main reason for not coming back after only 1 season in the booth. Many fans commented on Wheeler and Matthews style of doing the games, but when they heard the alternative with Moyer and Stairs, they had to be wanting some quality to return to the booth which was seriously lacking the whole season. The tandem of Stairs and Moyer were new to the booth and weren't ready to take on this assignment as most of the conversations weren't really game focused and the color commentary that they were supposed to be talking about often fell back to the games that they have played in the majors and a session on learning baseball, rather than what we were seeing happen on the field. What direction will the Phillies game day broadcast go in now? There can only be an improvement here as last year's games were extremely hard to listen to and even hear the comments made by Stairs and Moyer. It's been another fast year, and the holidays are here again. Let's give thanks this year to the things that we don't necessarily see everyday. The poor, the sick and the underprivileged. We distract ourselves throughout the year with our hobbies, the love of baseball and other things. Let's all try to do something nice for someone else this year. I am going to kick it off, with a donation to my local rescue mission from this blog, we'll feed 10 people for Christmas with the donation, and it's all made possible because of you, the reader, you stop by and patronize the blog and even click on an ad or two and make it all possible. Thank you, have a great holiday and please pass it forward! The new Major League Baseball season will get under way in April of next year, and bookmaker Betfair already have prices on which teams will make it to the World Series. Current joint favourites for the 2015 World Series crown are the Los Angeles Dodgers. The Dodgers have had great success in years gone by, but their last World Series win came way back in 1898. Since the end of the last decade, this side have shown steady improvement, and have now won the West Division in four of the last seven years, including the last two years consecutively. Farhan Zaidi has done an excellent job since arriving as General Manager, and the Los Angeles Dodgers certainly have a good platform on which to build now. With a decent off season, they can certainly be one of the leading contenders for MLB glory come 2015. The odds compilers at Betfair make the Dodgers 7/1 chances to win the next World Series and that is a price that will definitely appeal to a number of baseball punters. Joining the Los Angeles Dodgers at the head of the Betfair World Series market are the Washington Nationals, who can also be supported at odds of 7/1. The Nationals are a part of the East division, and have only been known by their current name since 2005. Previously, the Washington Nationals were called the Montreal Expos, but a move for the franchise to Washington, D.C. Meant a change of name was very much in order. While their trophy cabinet is pretty bare thus far, the Washington Nationals have made encouraging strides over the last couple of season, having won the East Division title in both 2012 and 2014. Manager Matt Williams has got his side playing some decent stuff and following some good draft picks, the Nationals now have a chance of some major honours in the world of baseball. As far as the Philadelphia Phillies are concerned, the bookies give the side little hope of challenging for Major League Baseball's biggest prize come 2015. The Phillies are ranked at 100/1 outsiders along with the Arizona Diamondbacks, Colorado Rockies and the Minnesota Twins. Having had a great spell from 2007 to 2011 winning five consecutive division titles, the Philadelphia Phillies have dropped off again over the last few seasons. Long time manager Charlie Manuel was sacked in 2013 and that would end up being the sides first losing season since back in 2002. This is now very much a rebuilding phase for the Phillies, and a lot will depend on what happens during the off season for this great franchise. The Phillies are rumoured to be looking at some Red Sox players and if the right men come through the door, then things can change very quickly as we see season after season. Those odds of 100/1 could look very big come next April if that were to be the case. Stayed up to date on all the latest market movers in the 2015 World Series at betfair.com. I read this story yesterday at Philly.com, you have to feel sorry for Ryan Howard after you read the whole story, which you can do here. You can choose your friends, but you can't choose your family. That's the old saying when things go wrong in a family, and that's exactly what happened with Ryan Howard. He started employing his family and paying them fantastically high wages for doing next to nothing and one day he woke up from that fact and decided to close the gravy store for them and now they've come back at him and sued him. Howard is paid very well, some would argue too much, for the Phillies. That wasn't his fault though, there was a contract offer made after Howard had several great seasons in a row. He looked as if he would continue to tear the cover off the ball for years, but in the last couple years, Howard has appeared more human than the super-human feats he put up when he was in his late 20's. This is just a bad story all the way around. Now it's public. Apparently, it's already settled out of court after it made it to court. The damage is still there though. It's what happens sometimes when a person comes into money like Howard did. Now the Phillies apparently look to shop Ryan Howard to a team where he can play out the remainder of his career. Yes, the Phillies still owe him millions, and Howard will be OK where ever he ends up, I still wouldn't be surprised if we see him in Phillies pinstripes come opening day though. The Phillies reportedly wanted Giancarlo 'Mike' Stanton for the last year or two. What no one saw coming though was this contract that was given to him by Marlins owner, Jeff Loria. A massive 13 year, $325M contract for a player who has hit the long ball very well, but is he one of the best in the game? He's been in the league for 5 years now, and has never put in a full season. Stanton's BA is at .271 for his career and he doesn't really have monster numbers like RBI, or a great amount of doubles per year. All in all, I don't think Stanton is anywhere near a ballplayer who should have gotten a $325M contract. The numbers just aren't there, he hasn't been on pace to be a Hall of Famer by any stretch either. This contract plainly makes no sense, now the Phillies have the dubious honor of no longer holding the worst contract in baseball.